Offspring of the Cabernet Franc and Sauvignon Blanc grapes, Cabernet Sauvignon is one of the most renowned red grapes of the world, rivalled only by Merlot for worldwide plantings and popularity. Its power base is in Bordeaux and especially on the Left Bank in Medoc and Pessac-Leognan, but it is grown in virtually all parts of the New and Old World including Napa, Sonoma, Bolgheri, Coonawarra, Margaret River and Penedes. Used as a pure variety or in a blend, Cabernet Sauvignon is easily recognizable for its black currant (from Cabernet Franc) and green pepper (from Sauvignon Blanc) aroma and flavour profiles and its impressively strong phenolic tannic structure that has great affinity for French oak barrel aging. Cabernet Sauvignon ripens later than Merlot and 2 weeks after Cabernet Franc and requires a relatively warm climate to reach phenolic ripeness. Because it ripens slowly, it can be picked on a flexible schedule, but the warmth required to ripen sometimes doesn’t materialize in wet and cold Bordeaux. This is one of the reasons Cabernet Sauvignon is most frequently blended with other varieties; by planting it alongside Cabernet Franc (perfume), Merlot (flesh and fruit), and Petit Verdot (spice), the grower is able to blend a final product that combines all the necessary elements and in effect has an insurance policy of sorts in case one of them is not as successful that vintage as was hoped. It is a small berry with a surprisingly high pip to pulp ratio of 1:12 (compared, for example, to Semillon which has 1:25). This combined with its thick blue skins accounts for its high tannin levels and the thick skins provide a great barrier to botrytis bunch rot and other rots and give it good colour concentration. In the case of this wine, Cabernet Sauvignon is the only variety. There is not usually any difficulty growing and ripening this grape in Sonoma’s Alexander Valley. Some actually refer to Northern California as the grape’s “…second home” (Jancis Robinson’s Oxford Companion to Wine). This wine is clear and bright, deep ruby with generous legs. On the nose it’s clean and still developing with pronounced aromas of ripe red fruit (raspberry, red currant, dried strawberry) and deep blackberry, the kind you pick on wild vines in August. There is significant vanilla along with nutmeg, sweet cedar, light kid glove leather and a slight quality of sage. On the palate, it’s dry with medium plus acidity and medium plus ripe tannins with the slightest and most satisfyingly small streaks of grip. There is medium plus body and medium plus alcohol balanced with the medium plus intensity flavour characteristics of more deep red and black fruits – Damson and red plums, black and red currants, more dried strawberry and ripe blackberry. Significant spice box, sweet tobacco and vanilla complement the medium plus length on the finish. This wine is WSET ‘Very Good,’ 11 years old, magnum bottled and drinking beautifully. It is full, velvety, fruit forward and nicely structured with adequate fruit, tannin and acidity to enable it to age a further and promising 5-7 years. 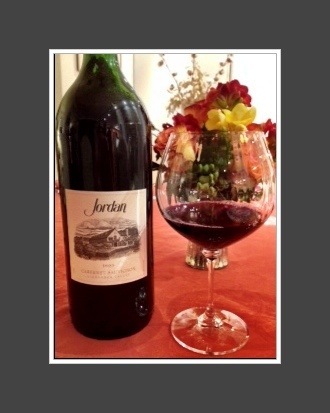 This entry was posted in Cabernet Sauvignon / Blends, California, RED. Bookmark the permalink.